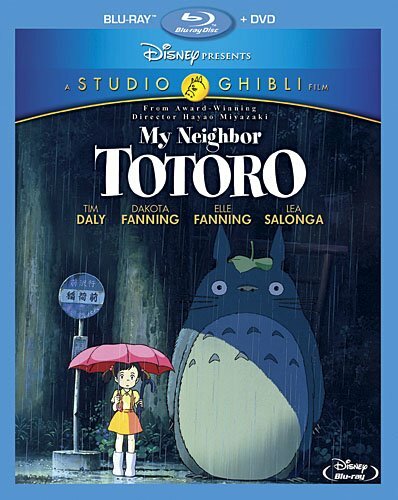 Howl's Moving Castle and My Neighbor Totoro are just two of Hayao Miyazaki's many fantastic anime films, and while neither is my favorite Miyazaki feature, they are both still really great films and have been recently released as Blu-ray/DVD combo packs. I tend to watch anime films with the original Japanese dialog using English subtitles to understand what's being said, but Disney's English dubbings are top notch with true voice talent and make experiencing the film in English just as pleasurable. My Neighbor Totoro is a very tranquil film, much more so than any other Miyazaki film. It's very serene and peaceful, which I know may sound kinda boring, but that couldn't be further from the truth. This movie is an emotional joy to watch as it's told from the perspective of two girls, ten-year-old Satsuki and four-year-old Mei, who are both completely adorable and so easy to love. The girls are moving to the country with their father while their mother is in the hospital, and the girls' excitement about the move is expressed brilliantly in their actions, how they run around exploring and just releasing their excess energy like little girls do. I also loved how Mei always followed and tried to copy her older sister. Miyazaki really knows how to make his characters feel like real people, and I really liked how he didn't play up the mom's undisclosed illness. We're never told what the illness is, and we're also never led to believe that the illess is serious. When we see the mom, she always looks healthy, and the only indication we get that there may be any seriousness to her condition is that she isn't able to come home when they expected due to a "cold". The girls were really looking forward to having their mom back at home, so emotions rose to the forefront when they found out about this, especially with the younger Mei. Anyway, the magical part of the movie comes in the form of various creatures which may be real and only visible to the girls, or may be products of their overactive imagination. There is evidence to support both theories, and it's never explained which theory is the right one, which normally I hate but here it just works perfectly. The creatures don't talk, but express themselves through body movements and facial expressions. I think it was a great way to handle these potentially imaginary creatures. There are some nice extras, such as the Behind the Microphone and Behind the Studio, and then there are the standard ones like storyboards and TV commercials. Compared to the Howl's Moving Castle extra's, I'd say this one has the better bonus features. Still, it's the movie that takes main stage here, and on Blu-ray it really impresses. So yeah, this release is definitely worth getting.